A few weekends ago Dave & I and a couple of our dogs went off to the north coast for a long weekend and I thought Id share a few things I packed to take with me. I couldnt do with my bourgeois shimmery blushes which I wear everyday. A little gold bow necklace was simple enough to go with anything I packed. Bangles: River Island & Love Nell. 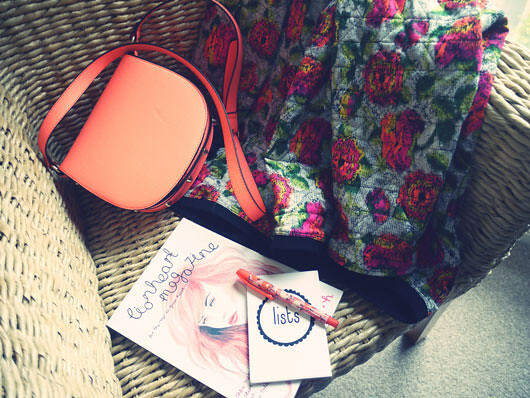 A little neon coral bag from H&M, my new fav marimekko-esque Zara sweatshirt, some light reading with an issue of Lionheart Magazine, a little lists notebook which was a gift from my sister. 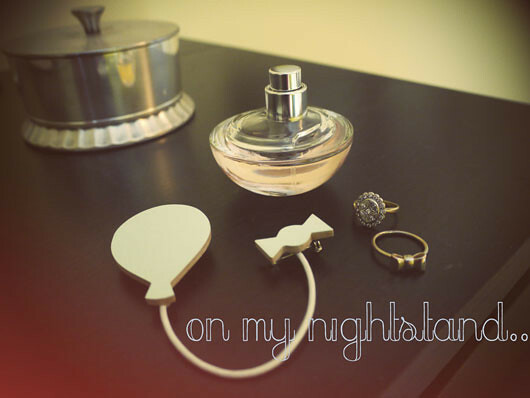 DKNY Delicious perfume, my engagement ring, gold bow ring from Madwell, balloon brooch gift from my sister. I love a statement brooch to add to a plain tee or chunky jumper. Without realising it my wardrobe for the weekend was in the yellow/acid lime colour palette. Knit Scarf: H&M, Tee: Mado, Floral Scarf: Forever 21, Lollipop tin: M&S, Headphones: Urban Ears, Drawstring Trousers: H&M, Yellow tip pumps: River Island. I havent managed to take any outfit photos this weekend having nothing but rain and insane hail?! Isnt it supposed to be May! Fingers crossed the weather improves soon... Im day dreaming of wearing summer florals, bare legs with ankle socks, open toe wedges... Im pretty sick of my warm wintery clothes. I love all the jewellery! I wanted to thank you for your lovely comment on my blogpost about organizing, but the pictures are not my livingroom. I'd wish it was this organized, roomy and light! Here in The Netherlands it started to rain again as well. I hate it, I just want it to be better weather again but on the other hand my hay fever isn't kicking in as hard as usual now..! Right now everything is in full blossom from the trees to the grasses. :( But let's hope the weather will be better soon so we will be able to walk around with nice dresses and bare legs. And I too need a blush - always. 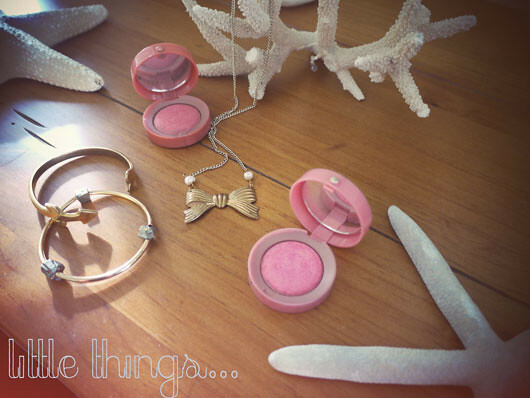 I have never tried a blush of Bourjois but I might try one after the one I'm using now. Is it any good? Love this bow ring! Am very jealous of your pics, definitely the thing I struggle with on my blog! Love all the acid colours! ah I love the yellow tones here, and those headphones are cute, I really fancy a pair. HOW MIKE LARRY LOAN FIRM GRANTED ME A BUSINESS LOAN!! !